My narcopath “borrowed” all of my hobbies and then tried to one-up me or prove that she did them before she met me. Then she would project her jealousy on me. Of course at the time I didn’t realize what was going on, just that it was odd and uncomfortable, like she was trying on my life or something. Now I am deep in the mire of the smear campaign and just figuring out that she is truly a narcissist. It’s so clear now, looking back. How could I miss it? How do her flying monkeys still miss it? I’m right where she wants me and it is sickening to feel so powerless and bamboozled. Thank you for your blog. I’m learning a lot here. 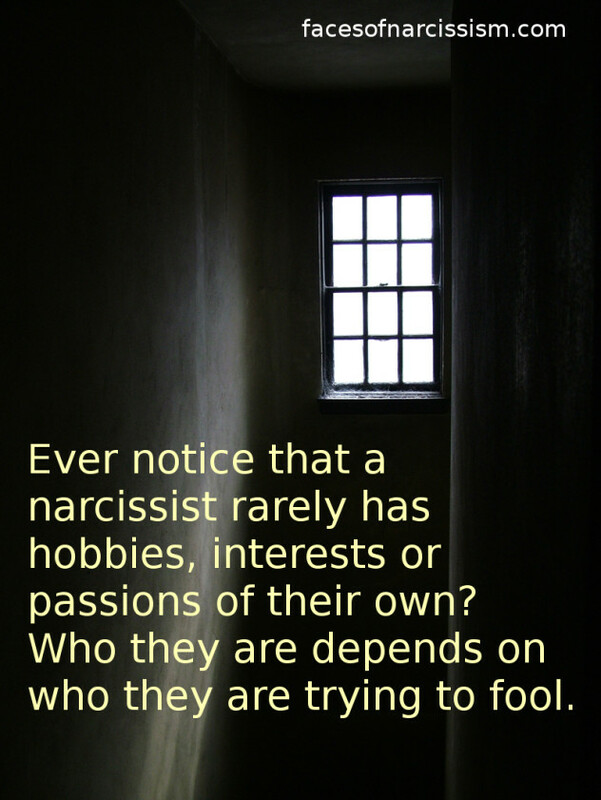 Covert narcs are the worst because they are so well disguised. It takes a while before we can manage to break free and go no contact for good but you will get there in time. It took me several times of going back myself so i know how defeating that can feel. But don’t let it get you down. Just promise yourself that the next time you really make a clean break with no contact as much as possible. I wish you well and hope for your best life for you and your children.